Dimensions 5.90 by 8.90 by 0.40 in. Amazon.com description: Product Description: If you only had time to read one book before becoming a front-line guide or interpreter, Personal Interpretation: Connecting Your Audience with Heritage Resources is the ideal resource. Written in clear, concise language with many examples, it employs the most current ideas in the interpretive profession. It also shares some of the rich traditions from interpretation's past masters, drawing on Freeman Tilden's principles and Enos Mills' thoughtful ideas on nature guiding. It will connect you with the more in-depth resources developed by authors such as Sam Ham, Bill Lewis, Douglas Knudson, Ted Cable, Larry beck, and Joseph Cornell. This resource shares the approaches tested and proven by the National Park Service and many other organizations along with the research concepts that back up their approaches. 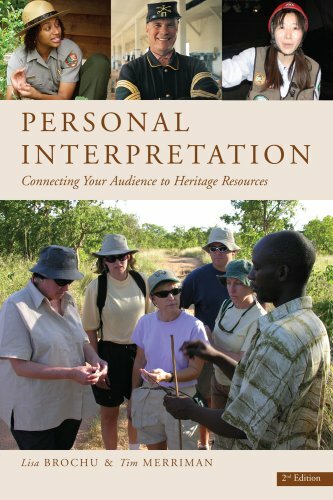 Authors Lisa Brochu and Tim Merriman collectively have more than 60 years experience in the interpretive profession as interpreters, consultants, planners and trainers.